Welcome To The International Clan Strachan Scottish Heritage Society, Inc. A 501(c)(3) non-profit public benefit corporation. 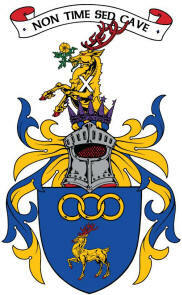 The Clan Council, also known as the Great Council (Gaelic: Comhairle Mòr), is a separate entity from the Clan Strachan Society, and is the governing body of Clan Strachan, e.g., the international family. As in ancient times, the Clan had a Representor (aka Chief or Commander) recognized by the Crown, who in accordance with Scots Law had legal rights over their clan in certain matters in the jurisdiction of Scotland. The Clan Council is subject to the Clan Strachan Constitution. Descendants of the grandfather Chief - Actively participates on the Clan Council as an officer of the Clan. * Must be a STRACHAN (broadly defined) by birth, and a Strachan Armiger. These are hereditary positions, that transfers with Arms. Generally must be a STRACHAN (broadly defined) by birth. Non-hereditary position. Clan Strachan Scottish Heritage Society, Inc.